FeastHome – Needless to say, a backsplash changes the mood in the kitchen. If your cooking area looks uninviting, it is time to switch out the boring backsplash for the fresh one. 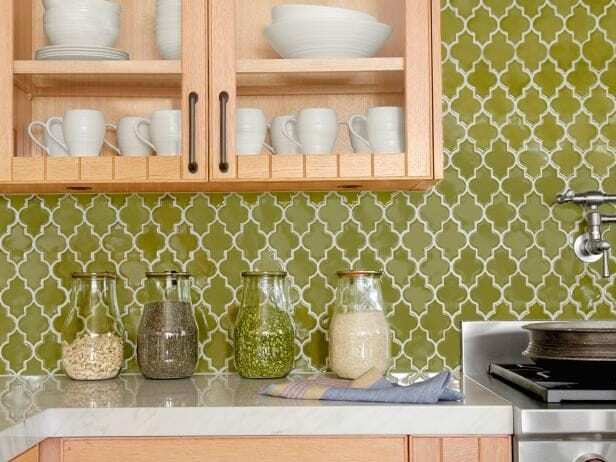 In case you love green kitchen backsplash, we’ve rounded up some ideas. As the earth’s color, green has a huge range of shades to choose from. Whether you go bold or bright, the result won’t disappoint you. Here are captivating backsplashes that help turn your dream kitchen into reality. This culinary space seems contemporary and cheerful at the same time. Thanks to the lime green subway tiles on the backsplash. The wall and plastic basket also have the same shade. Moreover, the white countertop, cabinets and open shelves tone down the vibrant elements. The floral painting and cat artwork are real showstoppers. 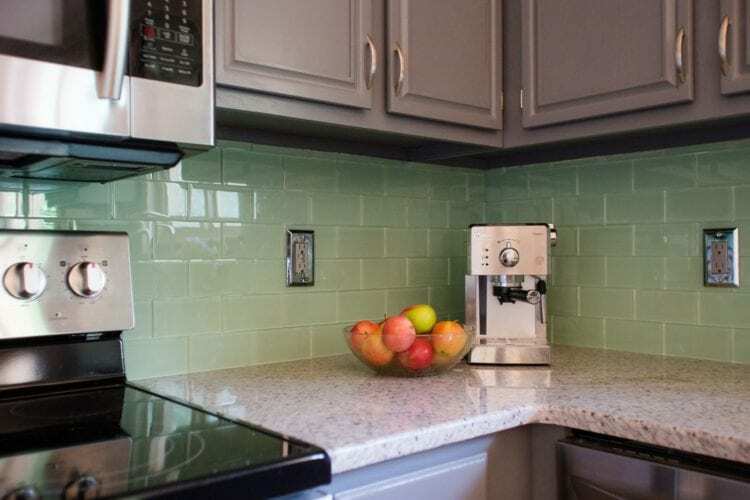 As seen in this picture, the sage green glass tiled-backsplash adds a splash of color to the mostly neutral kitchenette. It takes the space’s chic to the next level too. Plus, white grouts accentuate the tiles superbly. The white quartz countertop gives the kitchen a soft texture. While the turquoise hydrangea spices up the space. A predominantly neutral kitchen is synonymous with starkness? No, that’s not true. The slate and green subway tiles create visual interest as well as layers of texture. The window blind, floral print curtain, wooden floor, and black granite worktop offer added natural textures. And a large window allows the sunlight to stream into the area. In this cooking space, the stainless steel faucet, cooker, and appliances inevitably exhibit an industrial charm. These units also inject a macho character. 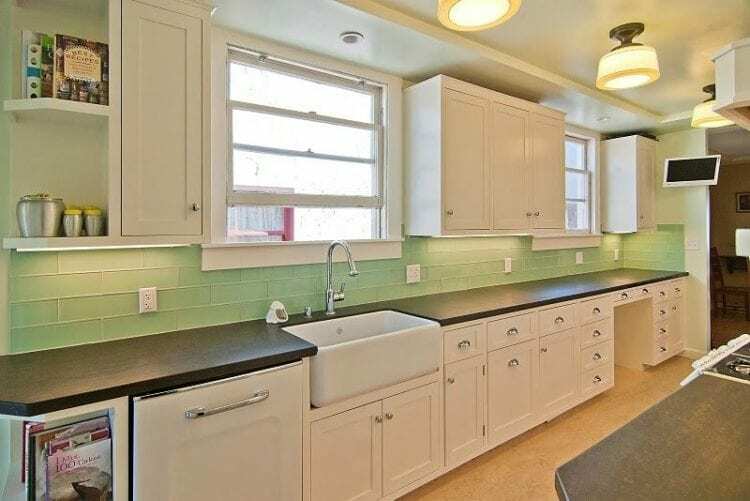 Additionally, the green glass tiles make for a one-of-a-kind backsplash. They pop against the crisp white wall and cabinetry. The potted plants purify the air and liven up the kitchen. 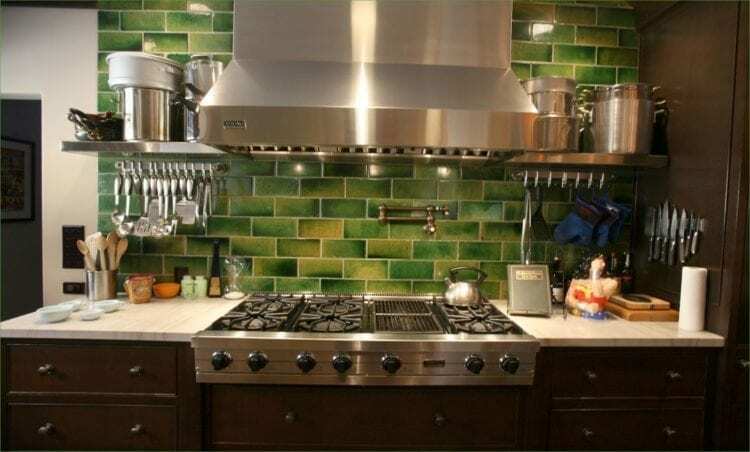 The homeowner uses green ceramic tiles to cover the backsplash. 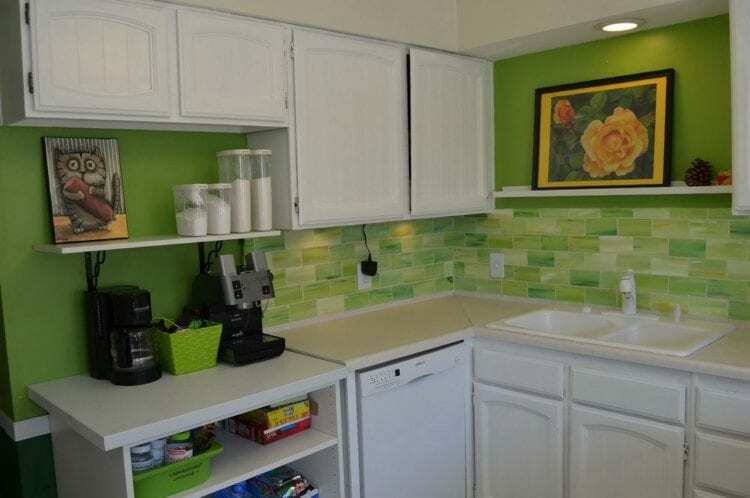 They do not just revitalize the kitchenette but also keeps the area from looking lifeless. Furthermore, dark wooden cabinets fill the culinary space with warmth. The stainless-steel appliances appear so shiny and bring memories of industrial age back. If you are not committed to a big contrast, give this idea a go. 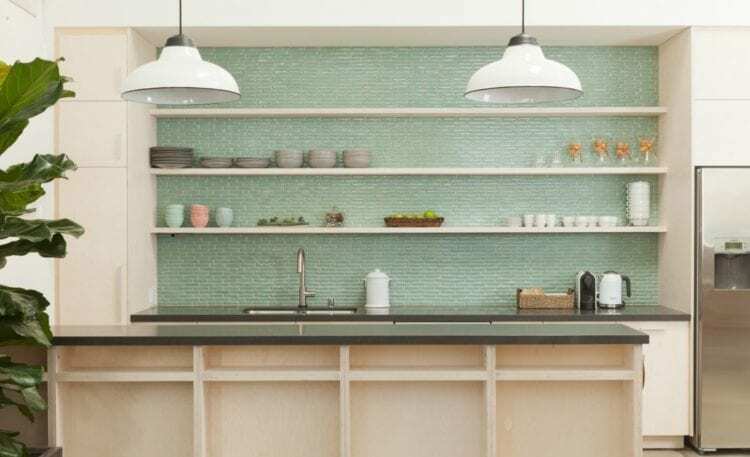 In this version, sea-foam green ceramic tiles clad the backsplash. With their help, the kitchenette feels serene and relaxed. The granite countertop lets the fruits in the bowl take the center stage. While the metallic grey-painted cabinets and stainless steel units release the industrial luxury. Speaking of the design, this cooking area is absolutely minimalist. The kitchen utensils are neatly stored in the white cabinets. So, they do not cause visual clutter. The wooden kitchen island promotes intimate nuance. Green and black ceramic mosaic tiles contribute to a high-end appearance. And grey countertop blends well with the backsplash. 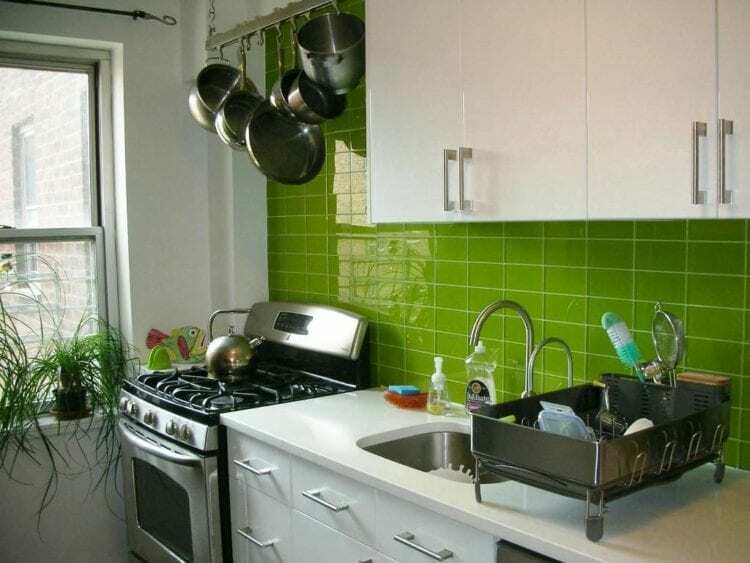 As you can see, jungle green tiles on the backsplash offset white ceiling and countertop. They look even more stunning in the herringbone pattern. Wooden open shelves and rattan dining chairs introduce textural contrast. A pair of brass pendant lights develop a posh statement. Lastly, potted greenery offers an organic setting. This is the cooking space that every man would fall in love with. 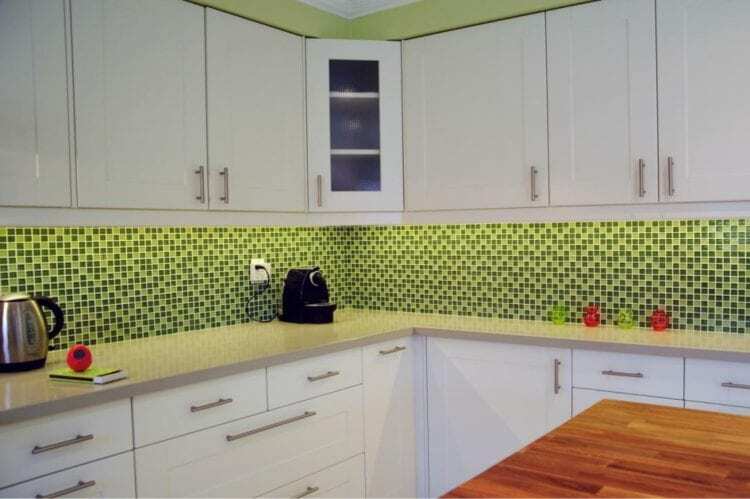 It employs the dark green tiled-backsplash which adds boldness and depth to the area. 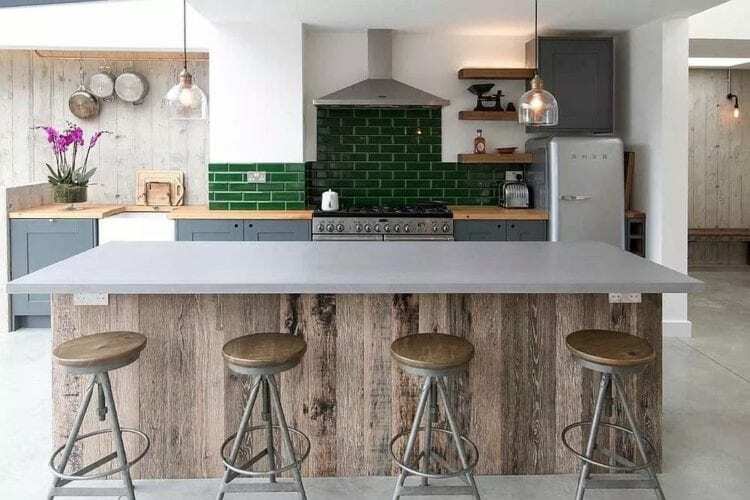 The reclaimed wooden wall and kitchen island produce unpretentious character. Copper rack, metallic refrigerator, cooker, appliances, and stools are industrially rustic. Meanwhile, the purple flowers prevent the kitchenette from looking cold. In this culinary space, the walls are painted in light blue. They evoke calm and seaside atmosphere. 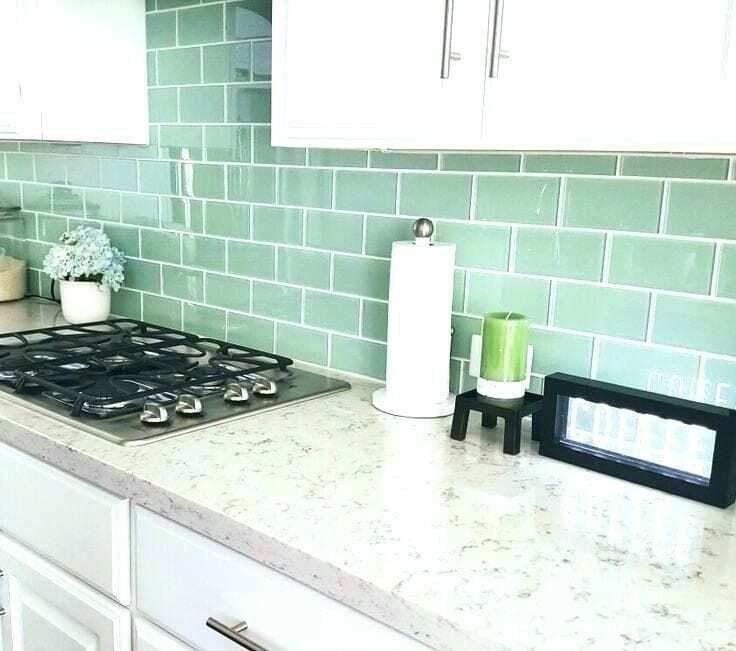 The green subway tiles deliver loveliness to the backsplash. The white refrigerator and cabinetry make the area bright. Both the glass door and windows let space feel sunny. Wooden countertop brings the natural element indoor. Subway tiles are timelessly classic. That’s why you will spot them in any space, including this kitchen. 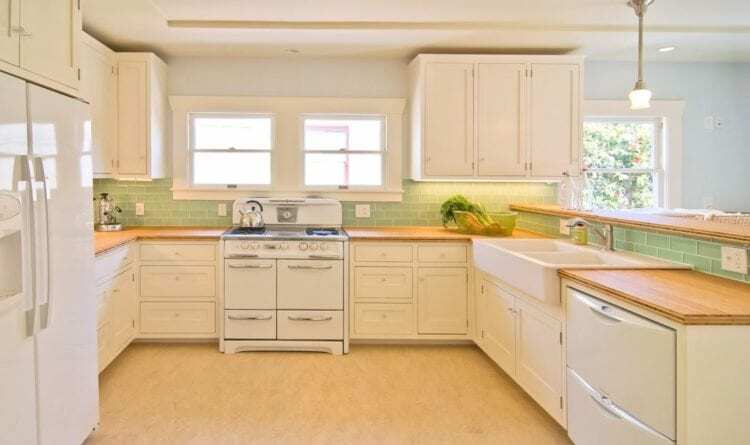 However, the smaller and thinner light green tiles on backsplash unexpectedly serve as a focal point. The long open shelves house pretty pastel bowls, glass jars, white teacups, and grey saucers. Two retro pendant lights illuminate the area. A large floor plant decorates the kitchenette. The homeowner wants an open and airy culinary space. To accomplish the mission, the ceiling and cabinets are painted in white. A black concrete countertop contrasts divinely with green glass subway tiled-backsplash. Three retro ceiling lights offer ambient lighting during the nighttime. Daylight shines through the window. Here, we have a kitchen packed full of exotic vibes. 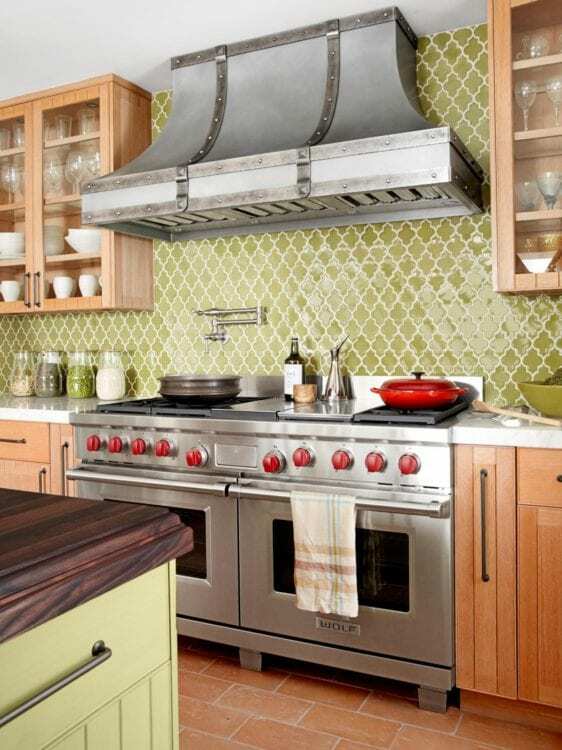 The moss green Arabesque tiles complement the cooking space as well as show off old world charm. The stainless-steel countertop and cooker bring a dash of shimmer to the area. Unfinished wooden cabinets are rustic in appearance. The Arabic spices blend seamlessly with the kitchen. Design wise, the kitchenette is undoubtedly rustic-industrial. Because it is filled with wooden furniture, metallic cooking appliances, and terracotta floor tiles. They instantly provide various textures. 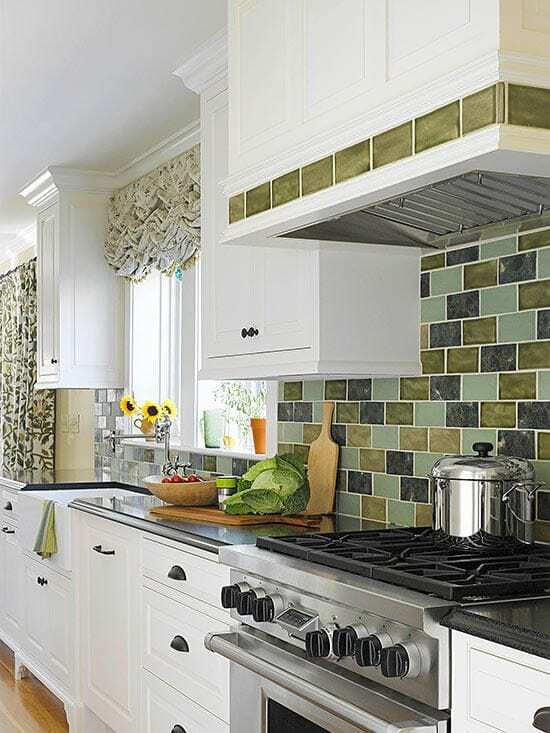 Pastel green kitchen island, green spice, and Middle Eastern-style backsplash tiles revive the space. The fiery red pieces infuse the cozy ambiance into the entire zone. Searching for a backsplash with an extraordinary twist? We guarantee you will adore this kitchen. 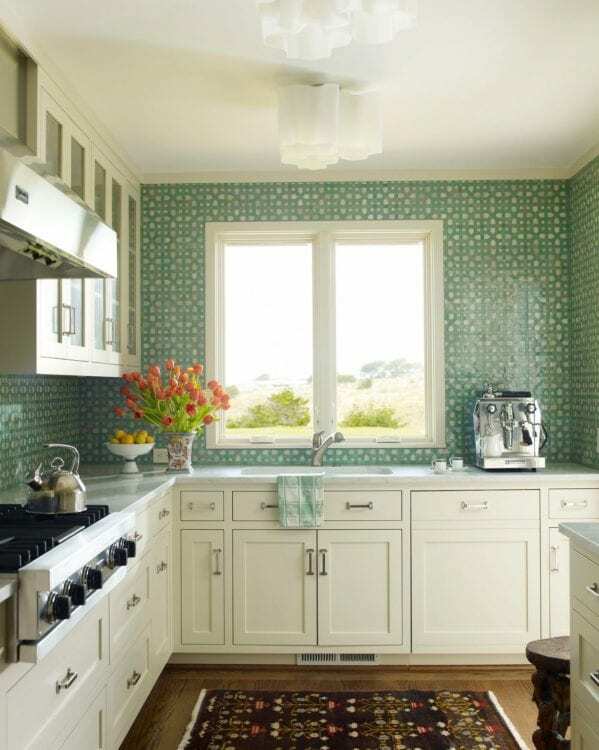 The green and white patterned tiles conceal the backsplash. Plus, they add a distinctively cool pattern to space. The white ceiling, cabinetry and ceiling light prevent the area from looking busy. Dark print rug and wooden floor develop a sense of intimacy. A window helps the kitchen to get more sunlight. 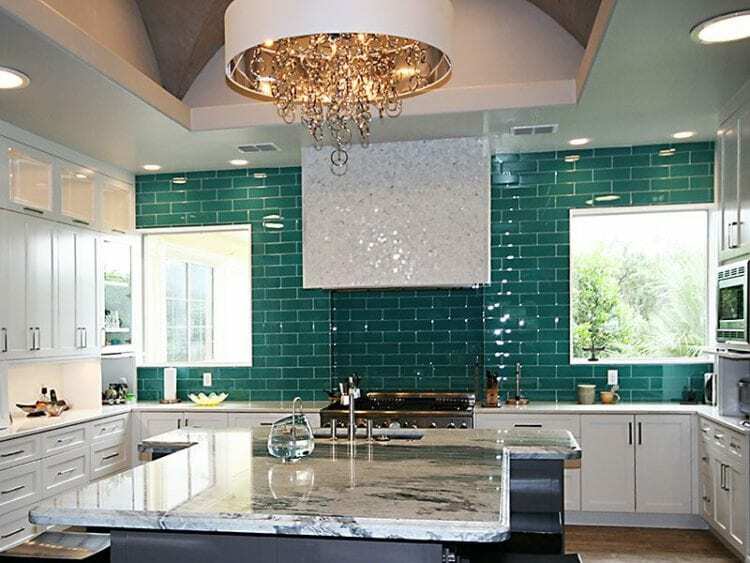 The Persian green tiles make for a glossy kitchen backsplash. There are also metallic accents in the forms of a panel, hardware, and appliances. The white ceiling and cabinet depict modern as well as the clean setting. A quirky chandelier oozes the deluxe elegance. Two glass windows allow the morning light to brighten up space. Marble countertop heightens the swanky character. What a kitchenette! 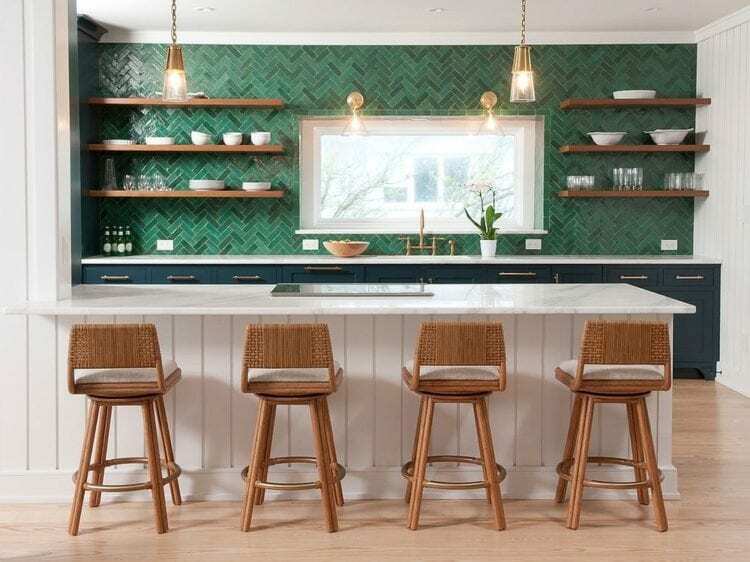 Those green kitchen backsplash ideas prove that is a versatile color. You can always find the right shade, be it subtle or dark or something in between. In addition, feel free to combine it with the other textures and hues.